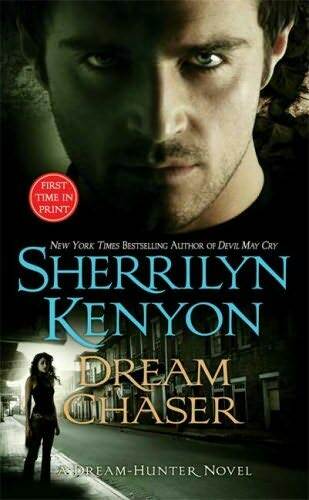 The latest novel by Sherrilyn Kenyon in her Dream-Hunter series, Dream Chaser tells the tale of Xypher, a nightmare Skoti, and Simone Dubois, a medical examiner. Xypher has been enduring a centuries of torment and has come to earth to get revenge on the one who caused his imprisonment, Satara. As with most of the feminine leads in Kenyon’s books, Simone was in the wrong place at the wrong time and gets linked with Xypher through some godlike weapon manipulation. I haven’t made up my mind on the Dream-Hunter series by Kenyon as of yet. This novel was good, but like the other two, it wasn’t spectacular. I don’t know what it is, but there’s really nothing from the novels that stands out in my head like her earlier work. I can still imagine Seize the Night in my head or even Fantasy Lover which was the first in the Dark-Hunter series. There was something about those novels that captured a person’s interest and held it even after they were done reading it. So far, I haven’t felt that with the Dream-Hunter series. Overall, the novel was good and I would recommend it to someone who likes the Dark-Hunter series, but I don’t know if I would go out and buy the series. The plot kept moving and it did throw some in twists, plus the characters were kind of fun. There is one bonus feature with this book….there’s an excerpt in the back for Acheron, which is out in August. I’ve got this author on my TBR list. Jut wanted to let you know that I enjoy reading your blog-you always have interesting author related info!! The Dream Chaser series aren’t that much different than previous books except for the fact that there is no “real” danger between the hero and heroine. There is no threat that the hero could bite said damsel and off her. Because of this, the tension level remains lower. You mentioned Fantasy Lover, I can’t say I remember the tension in that novel but do remember it as a good story which may prove me wrong about my last comment. Any thoughts anyone? I am hooked on the Dark Hunter series but have the feeling that the Dream Hunter series is just something to fill in the gaps between books. They are ok and I will go out and buy them because I enjoy the series. However I wish that the Dream Hunter had a bit more depth to it like the Dark Hunters. I know exactly what you are saying about being undecided about the Dreamhunters. I can really take the novels or leave them–and because of that I would mind if SK just stopped writing the series with this book!